With the loss, the Leopards drop to 6-4 in SCIAC and 8-12 overall, still holding fourth place in the conference ahead of Claremont-Mudd-Scripps (5-4). Although the Sagehens are the top seeded team in the conference, their game against La Verne would be their second of the day – their first being at Whittier where they narrowly won 14-13. The Leopards looked to take advantage of the tired home team. The game started well for the Leopards, with senior attacker Guarina Garcia drawing first blood only 30 seconds into the quarter to take the lead. 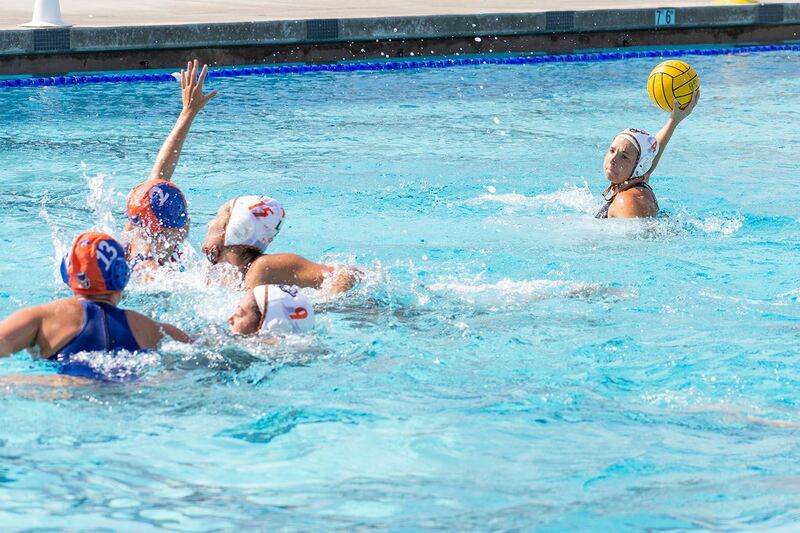 However, the Sagehens would go on a four goal run to take the 4-1 leading heading into the second quarter. La Verne’s turnovers proved to be costly, as nearly all of Pomona-Pitzer’s goals in the first quarter were scored off of La Verne mistakes. “Pomona’s very good, we know this, and they press so heavy and strangely never get called for it, so we had to make the adjustment,” head coach Pat Beemer said. The Leopards managed to fix many of their issues plaguing them in the first quarter and scored two unanswered goals by junior center Ilene Guerrero and Garcia to make the score 4-3, Pomona-Pitzer. The two goals were scored during power-plays, with the Leopards taking full advantage during their 6-on-5 scoring opportunities. Junior goalkeeper Shelby Garcia proved to be extremely valuable for the Leopards during their comeback, consistently denying Sagehen goals that allowed her team to come back. Though with just over one minute left in the half, the Sagehens managed to answer back with a goal. But that goal was quickly replied with just five seconds left by Guarina Garcia who completed her hat trick and cut the deficit to just one point heading into the half, 5-4, Pomona-Pitzer. Coming into the second half, the Sagehens would score just 30 seconds into the quarter off of a Leopard defensive miscommunication. Despite these sporadic breakdowns, the Leopard defense played strong, allowing zero points off of Pomona-Pitzer’s power plays. However, despite their fatigue, the Sagehen defense also came to play and made scoring very difficult for the Leopards, as La Verne was able to set up plays around the cage, but few led to goals. The attempted scoring plays would backfire on the Leopards with the Sagehens always rushing back on the counterattack faster. Luckily Shelby Garcia had a standout day in the cage, racking up a total of nine saves, many of which came during Pomona’s counterattacks. With the score 6-4 and the quarter coming to a close, Guarina Garcia broke free off of a pass from sophomore attacker Jasmine Kezman and took the ball up the middle for the score, again at a one point deficit heading into the last quarter, 6-5. In the fourth quarter, Guarina Garcia would once again step up for the Leopards, scoring off of a nice setup around the cage to tie the game 6-6 early in the quarter. Unfortunately the Sagehens would quickly answer back to regain the lead. With 30 seconds left of regulation the Leopards were looking for the score to tie, but a Leopard turnover inside the Sagehen five-meter lead to a counterattack that the Sagehens scored on, ending the game, 8-6. The team would bounce back in their game Wednesday against Caltech at home, where they dismantled the Beavers 12-6 and now improve to 7-4 in SCIAC. The Leopards now look to take on Athenas in a battle for third place as they take on Claremont-Mudd-Scripps on the road at 11 a.m. Saturday.